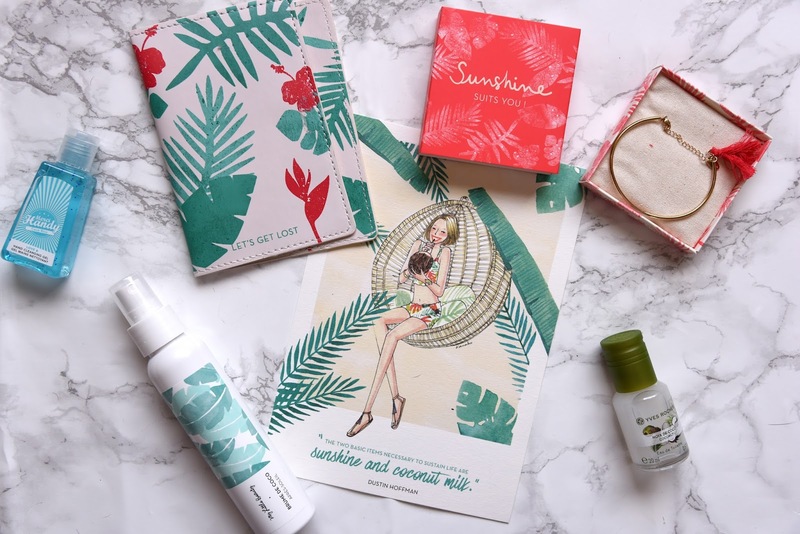 This month's My Little box is the epitome of Summer! Themed as My Little Coconut Box, what says Summer more than coconuts! There's so many nice bits and pieces I'll be able to use when I go to Mexico! Starting off with the lifestyle bits firstly there is this gorgeous palm print Passport Holder (£11). I've been meaning to get a new one for ages and this is right up my street, I love the design! It's also super soft and durable. There is also this level Bracelet my Stella & Dot (£18). It's so so nice, I love the little tassle detail. Onto beauty bits, firstly there is a My Little Beauty Coconut Spritzer After Sun Spray (£10), this smells amazing and I can't wait to take it away on holiday. There is also a Noix de Coco Eau de Toilette by Yves Rocher (£7 per 20ml). This is an amazing coconut scented fragrance, it just smells like Summer, again fab for taking on holiday! Next is a Coco Rico Hand Cleansing Gel (£3 per 30ml), what's better than a coconut scented hand gel?! Finally there was also a little mini sample of the Ojon Rare Blend Moisture Therapy Oil, so good for dry hair! Are you subscribed to My Little Box?